Scouting in South West England is about Scouting in the official region of South West England. It is largely represented by the Scout Association of the United Kingdom and some Groups of traditional Scouting including the Baden-Powell Scouts' Association. There are five student associations at various universities in the region, each of which is affiliated to the Student Scout and Guide Organisation (SSAGO). These are Bath University Guides and Scouts, Bath Spa SSAGO, University of Bristol Guides and Scouts, Scouts And Guides at the University of the West of England and Scout and Guide of Exeter, covering Exeter University. 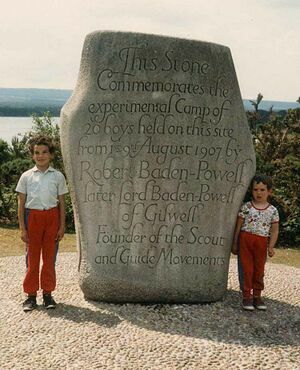 From 1 August until 8 August 1907, Lieutenant General Baden-Powell held the first experimental Scout camp for 22 boys on Brownsea Island in Poole Harbour in Dorset. The subsequent publishing of Scouting for Boys started the Scout Movement. In 2007, 100 years after the first experimental camp, there were a number of events on Brownsea Island. During the summer, The UK Scout Association held four camps, the Patrol Leaders Camp (a gathering of Scouts from every region of the UK), the New Centenary Camp (UK Scouts of every religion, race and background) and the Replica Camp (A living Museum of the camp 100 years before). The highlight of the four camps however was the Sunrise Camp. The Sunrise camp brought together 310 young people from 155 countries to celebrate the centenary of Scouting. On 1 August 2007, all 28 million Scouts from around the world renewed their Scout Promise at 8am local time as part of the Sunrise Ceremony, with Brownsea Island being a focal point of the celebrations. Avon Scout County is concurrent with the former political county of Avon. It provides Scouting to young people in Bath & North East Somerset, Bristol, North Somerset and South Gloucestershire. At the Royal Bristol Hospital for Children a special Scout Group, which allows patients at the hospital to take part in Scouting, and has been running since October 2001. Activities are catered to specific limitations of the patients, and are open to any child staying in the hospital and their siblings. The administration offices covering the 'Avon' area are at the Scouts' Camping and Activity Centre at Woodhouse Park. Axe District provides Scouting to the area around the seaside town of Weston-super-Mare. There are five active Explorer Scout Units in the District. Bristol South District is an amalgamation of two former Districts, and was created in 2005. There are 21 Scout Groups, and 4 Explorer Scout Units, with a total of 1,100 Scouters of all ages in the District. The District also runs a small activity centre at, East Winds, in Brislington. Brunel District was created in 2005, as a replacement for the Bristol North East District, and covers parts of north and east Bristol. It contains 20 Scout Units, 5 Explorer Scout Units and a Network Unit. Cabot District covers the western area of Bristol. As well as seventeen Scout Groups, the District runs four Explorer Scout Units. City of Bath District covers the area around the city of Bath in Somerset. Cotswold Edge District covers the southern reaches of the Cotswolds, an area immediately to the north of Bristol. The District also runs a Scout Campsite, Mafeking Hall, near Coalpit Heath in South Gloucestershire. Gordano Scout District covers the Gordano Valley in North Somerset, immediately to the south of Bristol.The District also runs a Scout Campsite, Glenny Wood, which is now open again following maintenance work. Kingswood District is to the north east of Bristol, and covers some parts of South Gloucestershire. Wansdyke District covers the area in the south east of the County, but does not include the city of Bath. The District also has the Chelwood Scout Campsite, which is owned and managed by the 1st Keynsham Scout Group. 37th Kingswood Drum & Bugle Corps and Cadet bands, both of which are currently the national champions for the British Youth Bands Association. Cornwall Scout County is concurrent with the county of Cornwall, and provides Scouting opportunities for young people throughout the whole of the County and the Isles of Scilly. There are nearly 80 Scout Groups with nearly 5,000 members in total involved in Scouting across the County. The districts within the County are currently being reviewed, with the aim of improving the organisation and provision of Scouting in the region. Each District has a number of Scout Groups and Explorer Scout Units, providing Scouting for young people from the age of 6 to 18 years. The County also manages the Scout Network, which is the programme section for 18-25 year olds in Cornwall. The County Scout Network consists of a number of Local Scout Networks..
Dorset Scout County is concurrent with the political county of Dorset, and provides Scouting opportunities for young people and adults in the area. Gloucestershire Scout County is concurrent with the political county of Gloucestershire. The County Scout HQ is based at Cranham where it has been present since 1947. The Gloster Gladiators Scout Band of the 46th Gloucester Scout Group was formed in 1957. Cheltenham District encompasses the town of Cheltenham and its immediate environs. Gloucester District encompasses the city of Gloucester and its immediate environs. It currently consists of 16 Scout Groups, 10 Explorer Scout Units and a Scout Fellowship. Royal Forest of Dean District encompasses the Forest of Dean to the west of Gloucester. Stroud and Tetbury District encompasses the towns of Stroud and Tetbury. Tewkesbury District encompasses the town of Tewkesbury and its immediate environs. 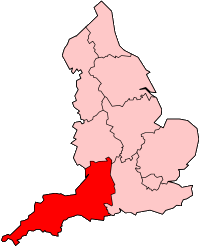 Somerset Scout County covers the political county of Somerset. Wiltshire Scout County covers the political county of Wiltshire. The BP Boathouse, situated in Harbourside in Bristol, is named after a warehouse keeper, Benjamin Perry. It is used as a Water Activity and Training Centre, and is jointly owned and managed by Avon Scout County and Girlguiding Avon and South Gloucestershire. Chelwood is a camping field owned and managed by the 1st Keynsham Scout Group, in the Wansdyke Scout District. Cleeve Hill is the City of Bath Scout District campsite and hut just to the west of the city. East Winds is the Bristol South Scout District campsite and hut in Brislington, near to the centre of Bristol. Glenny Wood consists of a seasonal camping field and lodge in Portishead, North Somerset. The site is maintained by Gordano Scout District. Mafeking Hall is located near Coalpit Heath, in the Cotswolds of South Gloucestershire. As well as the hall, there are a number of camping fields available to Scouts and Guides. Woodhouse Park is an activity and camping centre managed by Avon Scout County, sited in South Gloucestershire, and overlooks the Severn crossings. The site has five large camping fields, and two buildings which can be used for accommodation or training purposes. Woodhouse Park offers a large range of activities, either on site or nearby. Site hosted activities include Abseiling, Pioneering, Tracking, Climbing, Archery, and Air Rifles. Off-site activities include Sailing, Kayaking, and Caving. There are several camp sites in Devon run by or for Scouts. There are several camp sites in Dorset, including Brownsea Island Scout camp where Scouting started in 1907. Cranham, Gloucestershire Scout Association County Scouting Centre is situated in a Cotswold valley on the edge of the village of Cranham. It comprises a main camping area and residential accommodation. It also has a wooded valley known as Daniels Grove where there are facilities for 12 smaller "patrol" camp sites. It is adjacent to over 1,200 acres (4.9 km2) of beech woodland to which there is access for activities such as nature trails and orienteering. Leonard Stanley Headquarters is situated on the edge of the small Cotswold village of Leonard Stanley. Within the well hedged site there is a grass area suitable for games and camping, a car park and a large headquarters. The site is surrounded by farmland on three sides, and borders a minor road. Pennwood Scouting Centre is situated on the Cotswold Escarpment about 3 miles (5 km) South of Stroud and 3 miles North of Nailsworth. The Scout Association West Somerset District operates a small site at Tivington and, on behalf of the Somerset County Scout Council, the larger Horner Woods site at Horner. Sedgemoor District Scouts operate the Campbell Room, an all-year indoor self-catering centre on the Quantock Hills. The centre is nearly equidistant between Bridgwater and Taunton near Nether Stowey and just over a mile from the start of the Coleridge Way long distance footpath. Taunton Deane district have the campsite 'Huish woods' which is located just south of Taunton. website: http://www.huishwoods.co.uk/. the site is used by local Scouts and guides as well as the local community including schools. Potterne is the Scout Association County Scout Centre. This Gang Show was started in 1997, and generally has a cast of about 60 Scouts and Guides from the city of Bath. in 2012 they celebrated their 15th anniversity with a show durring the summer half term. The Bristol Gang Show is an annual production held at The Bristol Hippodrome, in Bristol. As the production is a Gang Show the cast is made up entirely by members of the Scouting and Guiding movement; many of the supporting members are also involved in Scouting and Guiding. The show currently takes place in October/November time, usually to coincide with the English school holiday held at this time. The show itself is a variety show, with singing, dancing and comedy. The show has a live orchestra, contains many different styles of songs such as 'pop' songs past and present and songs from musicals. In the 1930s there were two Boy Scout Revues, but it was not until 1971 that the Bristol Gang Show as it is now known was held. The 1971 show was performed not at the Bristol Hippodrome, but at the Victoria Rooms, the cast consisted of 85 Cubs and 59 adults. As over 6,000 people attended, the need for a larger venue was obvious. So, the 1972 show was held at the Bristol Hippodrome. In 1974 the Bristol Gang Show became Avon County Gang Show as the county of Bristol had become part of the Avon. In 1975 the standard of the show was officially recognised when it was awarded the Gang Show Emblem to wear on the red Gang Show neckerchiefs, this is an important award for a Gang Show to receive. Ralph Reader, who founded the Gang Show idea, came to see the show in 1978 and gave it much praise. In 1997 the show celebrated its Silver Jubilee, and regained its title of Bristol Gang Show. In 1999 girls were introduced into the junior cast, and now account for about half of the total junior cast. The show now has a cast of about 120, and is one of the most professional Gang Shows in the UK. The 2007 show took place between 30 October and 3 November, once again in the Bristol Hippodrome. 2007 celebrates 100 years of Scouting, and marks 25 years since the death of Ralph Reader who conceived the idea of a Gang Show. The Bristol Gang Show started in its current form in 1971, but there were a number of Boy Scout Revues in earlier years. The show comprises around 120 cast members, from both the local Scouting and Guiding organisations, with a live orchestra playing music from many genres, including modern pop and more traditional and classical pieces. The Gang Show was first performed in the Victoria Rooms, but moved to the Bristol Hippodrome the year after when it was realised how popular the show was with the general public. The show has remained there since. In 1975, the Gang Show received the prestigious Gang Show Emblem, allowing participants to wear it on their neckerchiefs. The show continues to be held annually, in late October or early November to coincide with a school holiday. Also known as Exeter and District Scout and Guide Gang Show, it has been performed every year in late March or April since 1983 (except 2004) at the Barnfield Theatre in Exeter. Members of the cast also participated at a Gang Show at the 1986 Westcountry Jamboree. Exeter Gang Show gained the national recognition of wearing the Red Scarf in 1987. Gloucester Gang Show is an annual production held at the Bacon Theatre, Dean Close School, Cheltenham. As the production is a Gang Show the cast is made up entirely by members of the Scouting and Guiding movement; many of the supporting members are also involved in Scouting and Guiding. The show currently takes place the week after Easter. The show itself is a variety show, with singing, dancing and comedy. The show contains many different styles of songs such as 'pop' songs past and present and songs from musicals. Swindon Gang Show has been running since 1976. ↑ Walker, Johnny. "Scouting Milestones - Brownsea Island". Scouting Milestones. http://www.scouting.milestones.btinternet.co.uk/brownsea.htm. Retrieved 2006-09-06. ↑ 8.0 8.1 "Avon Scouts Homepage". http://www.avonscouts.org.uk. ↑ "Scouting at Bristol Royal Hospital" (html). Scouting. The Scout Association. Aug/Sep 2005. http://www.scouts.org.uk/magazine/AugSep05/augsep05_p28.htm. Retrieved 2007-03-04. ↑ "About the Brunel District". http://www.55thscouts.com/?page=about/brunel. Retrieved 27 February 2009. ↑ "Band Links A-F" (html). British Federation of Youth Marching Band Organisations. 2007. http://www.marchingbands.org.uk/bands_a_f.html. Retrieved 2007-04-16. This page was last edited on 5 June 2012, at 16:59.